The construction industry has been, and continues to be, a key indicator of economic development. From the Neolithic Age where buildings were made from materials such as bamboo and clay, to the Industrial Revolution with the rise of the steam engine and circular saw, to today, where energy conservation and sustainable development are on the top of everyone’s minds, the construction industry is constantly growing and modernizing to be one of the most flourishing industries across the globe. As construction continues to enter a modern, digital-driven world, companies are seeing major changes in the way they can streamline operations. From the reinvention of personnel, to the use of virtual and augmented reality to bring imagination to life, the construction industry needs to stay on top of what’s here, and what’s next. The Internet of Things (“IoT”) is vast, connecting any machine, any system, or any site to the internet allowing for real time data and analysis. Below are a few way that the IoT phenomenon impacts the construction industry. Equipment Servicing and Repair. Sensors installed in machines can automate the process of maintenance schedules for equipment, can self-detect errors and lower maintenance/operating costs. Fixing machines before they break decreases opportunity for failure. Leads to workers changing their behavior. The construction industry often employees contractors, and a temporary workforce. These individuals are more prone to on the job accidents than a company’s full time employees. This is often due to the fact that they are not as well trained on safety processes and procedures. This can cost companies thousands (and sometimes even millions) in workers compensation costs year over year. 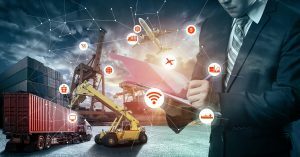 IoT helps workers, full-time, contract and temporary, to see safety management as an integral part of their daily routines. The technology allows for job site management when no one is physically present (i.e. informing job supervisor of movement). It provides companies with real time data, generated by IoT devices (i.e. wearable equipment), and allows them to combine this with industry big data to gain insights on how to change and strengthen safety programs. Company management can take action before workplace mishaps happen. IoT is transforming the way the construction workforce operates on a daily basis. Real time monitoring allows for construction management to know where equipment and staff are at any point in time. Task automation allows for budgets and schedules to stay on time, and streamlines record-keeping and administrative work. Predictive Analysis warns of minor problems before they become major problems, and minimizes machine downtime. As the world continues to be conscious of energy consumption, energy management and green buildings are on the rise. IoT allows for real time monitoring of energy consumption….even vacant rooms! They can do this through embedding sensors into concrete. Machines can also send back information on idling time so that on and off periods can be adjusted. IoT saves times and cost by tracking tools and equipment. It also allows for usage of the tools to be tracked and construction hours to be logged automatically. Building Information Modeling (BIM). Computer models are already used to replicate real life construction. With IoT the computer models can be updated real time by sensors placed in the constructed buildings. The sensors can send back information such as how the building will be affected by changing climates and time, energy efficiency, etc. It allows companies to learn and create better structural alternatives. As an example it could measure how a bridge shifts under a certain weight or how a building would hold up in an earthquake. IoT is here to stay. It allows for construction companies to save time and money by developing new ways to operate. 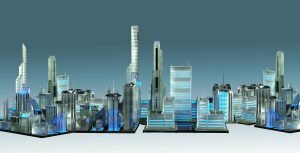 As it continues to be adopted by the industry the economy is set to see a major shift in how buildings are constructed, and society is set to see a major change in how the buildings we work, live, and socialize in begin to change. Find more information on DKB’s Construction Services Here.